Recipe originally published by Taste of Home. For those that don’t know me very well, I LOVE LOVE LOVE making Christmas cookies. At one point, I was making almost 20 different kinds for the holiday season. When money got tight, I had to seriously pare down that list and this cookie was one of the ones that made the cut. Of course, you can enjoy this delicious cookie year round. It is also one of those cookies you can make and bake, refrigerate, or freeze to use at a later date. See how much fun it is to rhyme? I do it all the time. hahahahaha… <clears throat> ahem. I didn’t change the recipe. Instead, what I did for this post is give you some help on how to streamline your cookie baking and keep cookies and batter around for future baking dates. Now, baking is not my strong suit. I’m much better at cooking, so you can see that it isn’t too hard to make a batch of these cookies and have them look pretty. My cookies may be a little more “golden brown” than theirs, but they still look very pretty and of course they taste great. Let me tell you, it is a special gift to be able to get cookies that have that perfect look. Don’t beat yourself up if you get a batch or two that doesn’t turn out as pretty as the others. In fact, when I bake, I will hand pick out which cookies and baked goods will be given away. My husband is given a very specific directive to stay away from the freshly baked goodies until I tell him which ones he can eat. 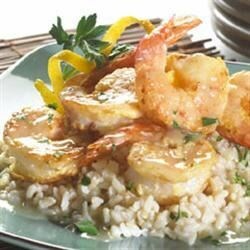 Recipe originally published by myRecipes daily e-zine “Dinner Tonight”. There’s not much to this dish. There are three basic ingredients: CHILI powder, LIME, and SHRIMP. Shocking, right? I went through a period where all I wanted was citrus in my food. (It was very similar to my mushroom phase, which I’m still in, but not as intense as before). I didn’t make any changes to this recipe, I just elaborated on the ingredients and equipment needed. I was really proud of the way this dish turned out. Of course, it wasn’t like I was making Baked Alaska, a soufflé or Coq au vin. There’s only 6 ingredients and it’s mostly sauté and stir. But cooking shrimp takes attention to detail or you could end up with little rubber pieces in sauce. First, I am going to say that I really didn’t “change” the recipe. I just elaborated on the ingredients and listed all of them in the instructions. I hate it when they say, “the next six ingredients” and make you count them. Now on to the recipe… I love chili and have a favorite recipe that I used to make often. I realized, one day, that my husband was not eating it with me, and although he won’t admit it, I get the feeling he just didn’t like that dish. Chili isn’t that healthy of a dish, so I started searching for a turkey chili that would rival my favorite ground beef chili recipe. This was one of the first turkey chili recipes that had a tomato sauce. I was excited. I printed off the recipe and it sat for a long time. Then I got that craving for chili again. I didn’t plate mine with the cilantro bunches. I’m just not that big of a fan of that much cilantro in one place. And of course, the obvious difference is the sour cream. I love sour cream in a hot bowl of chili, so I ate it that way anyway, but that’s not the point. The point is, the recipe didn’t say that, and if you’ve read any of my other posts – that annoys me. If you look at the chili, it is pretty similar. Mine is a little more “juicy” but that is how I like it. Recipe originally published in Kraft Food and Family – Holiday 2010. I subscribe to a lot of food magazines. One of the biggest issues I have is that I’ll make lists of everything I want to try, and then when I revisit the recipe to make it, I’m not so sure it is all that appealing anymore. This was one of those dishes. Originally published as an appetizer, I didn’t feel like going through all of the work for finger food. So I made the decision to make them larger so they could be a meal and move ahead with cooking. Part of the problem was the amount of chili powder I used on top of the empanadas. One teaspoon would have been appropriate to sprinkle over 16 of them, but way too much for 8. You probably also noticed that mine are more triangular. That’s because I quartered the pie crusts instead of using a biscuit cutter. Didn’t affect the taste and really doesn’t look “ugly” in terms of food standards. Recipe originally published in Kraft Food & Family – Holiday 2010. I love Italian food, but I’ve never had baked ziti. Ever. So this quickie-version of the dish intrigued me. If you cringe at the thought of eating sauce from a jar, you can always make your own favorite marinara sauce and use that. Of course, don’t discount all jarred pasta sauces. My favorite is an organic sauce with no preservatives that has a great taste. As you can see, I ended up with what Kraft intended when they created the recipe. I even managed to get it to brown like they did. Although they didn’t show a serving, I wanted to make sure you could see how nicely it scooped out of the dish and how the cheese melted all the way through. Back when winter was hitting us smack in the face for the first time this year, I had a craving. This craving was for all things stroganoff-like. Without even realizing it, I made 3 or 4 dishes in a month that were very similar. This dish read like a quickie-stroganoff with an Italian zing. The writers seemed to really care about the nutritional information – they lightened up the ingredients and made sure the sodium levels were in check. I also liked the seemingly short prep and cooking time. Admittedly, mine looks a little runnier. I poured on the sauce when I plated it, and for some reason, I clustered my peas like I grabbed a handful and plopped them on there. The sauce may be a little runny because I love olive oil, and can be heavy-handed at times. (Oops! I splashed a little over the teaspoon. My bad. Oops! I did it again!) Most of the time, it doesn’t make a difference, but clearly here it did – well at least in presentation. It certainly didn’t mess with the taste. Last, I didn’t spend the time I should have chopping the tomato to make them in pretty little pieces. Instead I have big chunks. Recipe originally published by allRecipes.com daily e-zine “The Daily Dish”. It is a vegetarian soup that isn’t a broth. I couldn’t WAIT to try this! First I have to say I was shocked that a vegetarian dish had such high sodium content. Looking at the ingredients, I couldn’t figure out where it came from, so I turned to the recipe’s comments. Now I have to admit, nothing angers me more than people who “review” a recipe just to say they didn’t even bother because of “xyz”, in this case sodium. You want to impress me anonymous reviewer? Tell me how you would lower it. Anybody can whine – I mean, I do it all the time – but it takes someone with talent to fix the problem. I was really happy to see that allRecipes did a little research (it was the broth) and posted some information in the comments about lowering the sodium level. Also, I did a little research on my own, so the recipe changed for all this information. Comments can also come in handy when looking at recipe sites because people often will give substitutions or ways to fix mistakes. The bad thing is they can also scare you too. I always look at the lowest ratings because if you’re raving about it, I have no worries about the recipe. Sifting through the whiners about the sodium level, I found a lot of comments regarding the “bland taste” and “bad texture.” Since the dish is fairly inexpensive to make and I already had most of the ingredients, I decided to give it a try anyway. The picture from AllRecipes looks a little thicker, where my soup looks more like a rich broth. Mostly, they look very similar. I have to say that I think this soup has plenty of flavor and was delicious, but if you don’t like beans, this will not change your mind. I’m not going to lie. Chickpeas freak me out. I don’t know why. Maybe it’s because I think of hummus, which I like, but find bland when not flavored correctly. By the way, if you’ve never tried hummus, you’re missing something. Pick up a small container of Sun-Dried Tomato hummus and a bag of pita chips – you won’t be sorry. Anyway, this very simple recipe contains chickpeas and not many spices, so I was a little nervous about how well this was going to turn out. I’ve really made an effort to try to make vegetarian dishes more often (and more than just mac ‘n’ cheese) so I decided to give it a go. I chose not to garnish with basil leaves, but my result is pretty close. Again, my plating isn’t as pretty, and I SWEAR I’m trying to get better at that. In this case, I shouldn’t have used a pasta bowl and found something a little more compact. Other than that, the dishes look very similar. One thing to note, the recipe calls for grated cheese. They clearly used shredded, and so did I.
I love chicken and dumplings, but it isn’t one of the easiest dishes to make. When I saw “Quick” and “Chicken & Dumplings” in the same title, I was game. I have to admit, when I saw that the dumplings were made out of tortillas, I was a little skeptical. I am certainly glad I decided to give it a try. Pretty close, right? I’m not sure if I just scooped out too much broth for my picture, but it wasn’t thinned out or watery. Now, I would never say that tortillas are an exact substitute for dumplings, but it definitely mimicked it well enough that I didn’t mind. Recipe originally published in AllRecipes daily e-zine “The Daily Dish”. If you saw my post on February 14, 2011, you know that out of the blue, my husband announced that he would gladly eat pork chops after refusing for about, oh, 9 years. In my scramble to make as much pork as possible, I found this delightful low-calorie recipe that incorporates two of my favorite foods, mushrooms and onions, into a great casserole-type dish. I’m sure I’m biased, but mine looks so much better than the published picture. It just looks juicier. They didn’t specify the type of pork chop to use in the recipe (don’t worry, I do in my version) but it looks like I probably picked the right one. Recipe originally published by AllRecipes in the daily e-zine “The Daily Dish”. Another dish that can be served as a main dish or an appetizer! I decided to serve this over a bed of brown rice and eat it as actual meal. This was a recipe created by one of the website’s readers. As I was scanning the comments, so many people were complaining about the calories. At 391 calories, I can think of a lot worse meals to eat. I also found it interesting that you don’t cook the shrimp in the butter, but you bake it and use the butter as a drizzle. I decided to go for it. Not bad, right? I removed the tails from my shrimp. I always do unless the recipe specifically tells me not to do it. I just don’t like having to stick my fingers near my mouth while I’m chewing to pull it off. With my talent for hurting myself, I can absolutely see me biting my finger. Recipe originally published in Taste of Home’s weekly e-zine “Menu$aver Newsletter”. On occasion, I’ll look for light recipes to make for lunch. Unfortunately, there aren’t many of them out there. This recipe wasn’t meant to be a lunch recipe. It was meant to be a quick option for dinner; however, I think it would do much better as lunch fare. Put aside the fact that I don’t have the ability to plate a dish as beautifully as Taste of Home – I mean look at the perfect positioning of those noodles! – my end result came really close to that of Taste of Home. I used wheat pasta, which gives the dish a darker appearance, but other than that, I seemed to have nailed it. Recipe originally published in myRecipe.com daily e-zine “Dinner Tonight”. Slow cooker meals ROCK! Now I’ve said it before, but I’m a little scared of turning on my slow cooker and leaving the house all day, so even though I own several different sizes of slow cookers, I rarely make anything in them. One day, I had some heavy cleaning and laundry to accomplish and knew I wasn’t going to be in the mood to cook (or probably find the time) when I was done, so I decided to go the slow cooker route. It was just before Halloween and we had suffered a major storm (anyone remember those winds) that brought in the first true cold weather of the season. 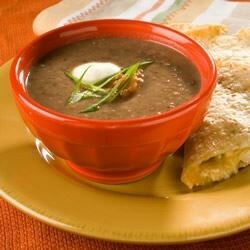 I found this recipe from MyRecipes.com to be the perfect blend of comfort and cold weather food. It tasted as good as it looks. My meat shredded when I scooped it out, but that was because it was so tender. My stroganoff also had more gravy on it, but I can’t say that I was disappointed about that. I had a happy accident while cooking that probably changed the flavor a little bit, but more on that later. Even though you can’t tell from the pictures, there was one major issue I encountered while cooking this recipe. The original recipe doesn’t include egg noodles in the ingredient listing. I know how difficult it is for recipe writers to get every little detail correct, but this is what you would call a MAJOR COMPONENT of the dish. Up until last year, my husband wouldn’t eat pork chops, then suddenly one day – WHAM – he said, “I don’t know why you thought I wouldn’t eat pork chops.” Sometimes it is just better not to argue or try to understand… you just go about your business and look for pork chop recipes. 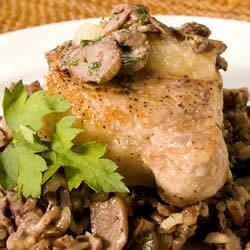 “The Other White Meat” can be a little bland, so when I found a Creole spiced recipe, I was all over it. Mine didn’t turn out as “tomato-ey” and it looks like there is a lot more spice on their pork chop. It was still very good and perfect with a side of potatoes (as shown) and a small salad. Recipe originally published on AllRecipes.com Daily Dish e-zine. The picture from AllRecipes wasn’t professionally taken (visitors can submit their own pictures of dishes that they make) so it is a little fuzzy looking. From what I can tell, it looks about the same, although their picture looks a little creamier than mine, but that’s probably because one of the ingredient changes I made. I don’t know if that makes a difference or not, because the one I made tasted delicious. Recipe originally published in The Daily Dish e-zine. Now I have to get this out of the way: I’m not from Texas. I’ve never eaten “authentic” King Ranch Chicken. I’m sure King Ranch Chicken is just like Philly Cheesesteaks & Chicago Style Pizza – there’s a million ways to make it, what is in it varies from person-to-person, and everyone thinks their version is the right one. What I’m getting at is this – I have no intentions of arguing with anyone about this not being “real” King Ranch Chicken Casserole. It looked yummy and I decided to make it. It wasn’t until I started to write this blog post and decided to read through some of the comments that I saw the “this isn’t the way you make King Ranch Chicken” and “this is an abomination to anyone from Texas” posts. Now that the unpleasantness is out of the way, let’s get back to the recipe. Chicken is a staple in my kitchen so when I stumble on a chicken casserole, I’m all in. What intrigued me about this recipe is the subtlety of the southwestern flavors. What I did was I used some of the suggestions from all of the variations that were listed below the original recipe to create a final product. Part lightened King Ranch Chicken and Quick-and-Easy King Ranch Chicken. Pretty close, but I do have a complaint. First, it looks like they left their corn tortilla chips whole instead of crushing them. Second, WHAT THE HECK ARE THEY DOING IN THERE IN THE FIRST PLACE! Again, a photo is taken of a recipe that clearly doesn’t use the same ingredients. If they followed the initial recipe, they should have used corn tortillas cut into ½” strips. I guess I shouldn’t complain since I chose to use the corn tortilla chip option, but that’s not the point. Wait, what is my point? Oh, never mind. Recipe originally published in Kraft Foods Magazine, Holiday 2010. Potato soup is one of those dishes that is perfect for a cold winter day. Also, there’s a lot you can do with it. For example, you can add cheddar cheese and make it a cheese-potato soup. Got some extra bacon from breakfast? Crumble it up with a little green onion and sour cream and you’ve got baked potato soup. What I’m saying is you can make a big pot and serve it one way one night and serve it in a different form the next. That’s why I’m always open to trying a different recipe when I find one. This was the first time I saw a recipe using leeks that blended them directly into the soup. My potato soup didn’t turn out as creamy. Honestly, I like a little bit of potato chunk in my potato soup, but this wasn’t intentional. I also didn’t dress it with the chives for the photo, but neither did Kraft. No, they actually put bacon on top of theirs. Of course, this is an absolutely delicious way to serve the soup, but not what the recipe calls for. If you’ve read any of my other posts, you’ll know that I’m not very fond of that. Recipe originally published in Kraft Foods Magazine, Holiday 2009. I can never make enough Christmas cookies. I love having a HUGE variety. I always plan big and buy everything I need. Unfortunately for me, I usually get exhausted about half way through the process. It isn’t that I hate it or I don’t want to continue, I just get tired and seem to run out of time. Therefore, I’m usually looking for very simple recipes that involve melting, mixing, cooking… the basics. My husband loves chocolate, so I thought I’d give this recipe a try. He loves it and requested it again Christmas 2010. It will be a permanent fixture on my cookie list. It was incredibly easy and looks exactly like the photos of Kraft’s website. Of course, it tastes good too, so it is a winner all the way around. I enjoy finding double-duty dishes. This dish is meant to be an appetizer; however, I cooked up some brown rice and made a meal out of it. Perfect, especially when it comes to appetizer dishes. Since it is just my husband and I, we don’t get a lot of use out of appetizers. Of course, on occasion, I’m asked to bring one somewhere or we have people over. Well I’m not a big fan of making something that I’ve never made before for a special occasion or for guests. Thus, appetizers I can make for dinner are exactly what I’m looking for. I was really proud of the way the meatballs turned out. Browning them in the pan was a lot more difficult than I had anticipated. Set off the fire alarm a couple of times too. But I held them together and went forward & they looked great in the end. Had the rice not been there, I think the pictures would have looked VERY similar. Recipe originally published in Cooking Light, June 2010. Salmon is a super food. It’s got healthy fats in it (Omega-3 anyone? ), a great source of protein, and a large supply of vitamins, including Vitamin D – of which I have a severe deficiency. Because of this, I’m always looking for different ways to cook salmon. There are several things that attracted me to this recipe. Obviously, the salmon is one of them, but I was also excited to try the rice side dish. I’ve never cooked basmati rice and this seemed like a very straightforward recipe to try. Unfortunately, I wasn’t terribly impressed with the dish when it was done, but more on that later. The pictures reveal everything that I found wrong with the recipe. First, the amount of spice rub you make for the salmon clearly wasn’t enough for the amount of salmon in the recipe. Second, I think the cook times are a little off. The fish was a little dry and didn’t get that pretty broiled look on top. Finally, I think the rice could use a little more cashew in it. This is a total meal. Other than possibly needing some crusty bread, you’re set with the evening’s dinner. Of course, as much as I love Cooking Light creating a complete meal, they also chose to not publish all of the recipes together… or put both recipes in the step-by-step formatting… or even LINK to the Orzo dish from the Chicken Milanese. THAT, lovely readers, is very annoying. I had to search high-and-low for both since I forgot to print them out after I made it. As is usual for me, I began to panic over attempting another breaded chicken dish. I struggle with breading and frying – ALWAYS cooking the breading unevenly and USUALLY burning at least one of the pieces of chicken. This was also my first attempt at cooking orzo, but that shows you how easy this recipe was… no problems with perfectly cooked chicken, a great salad and delicious orzo. Pretty close! Of course, I used a different salad blend (see below) and my orzo looks a little creamier than Cooking Light. I even think, and of course I’m biased here, that my chicken looks more evenly browned than theirs. Succeess!!! Recipe originally published in Cooking Light, April 2009. One of the monthly features of the magazine, Cooking Light, is when they take a fat, calorie and generally unhealthy food favorite and make it a light meal/treat. I’ve tried several of these recipes and have never been disappointed. I was giddy with excitement when they decided to re-make butterscotch bars. See, I love bar cookies. I love butterscotch. I love streusel. This recipe has them all. I’d run the dry ingredients of my streusel base & topping through a mini-chop or a food processor. I’d make sure my butterscotch layer was a little more melted so it would spread easier. I’d try to evenly distribute the topping over the top layer. Now mine isn’t as pretty, but it tasted delicious and ultimately that is what matters most. Recipe originally published in Real Simple, May 2010. I love Italian food. The sauces, pasta, cheese – I could go on forever. What attracted me to this recipe was the fact that it slimmed down (at least a little) my favorite spaghetti and meatball recipe. Of course, I didn’t jump into this without some apprehension and the calorie and fat content aren’t all that impressive for this dish. Ground beef doesn’t need much seasoning to make a flavorful meatball (thank you fat), but turkey isn’t that easy. I was surprised to see minimal seasoning going into the meatballs and crossed my fingers as they were cooking. I don’t know if I could get much closer than this. On top of that, it was FANTASTIC! Each meatball was like a little turkey parmesan ball. Absolutely delicious!